Rae the elf is back, the tree is up (only 4 shattered ornaments this year… so far 😩), and the Christmas music is on heavy rotation. The holidays have officially arrived at our home! ‘Tis the season for ginger bread houses, holiday crafts, (extra!) sparkle, and of course… Christmas lists! Here’s a roundup of Lane and Lauren’s most wanted gifts this year. From the moment the girls set eyes on this at our local toy shop, they were in love. This roll-up keyboard lays flat for playing at the kitchen table, on a desk, on the floor, wherever – and conveniently rolls up for easy storage. It records, plays songs and background beats, and most importantly, indulges their love of music. Here’s hoping Santa brings this awesome instrument this year – and here’s hoping the girls remember how to share once Rae returns to the North Pole! Lane and Lauren are officially OB.SESSED. with Descendants and Descendants 2, and honestly, so am I! The songs are just as sassy as the girls are, and I’ve spotted them studying the dance tutorials on the Disney NOW! app, perfecting all of Mal and Evie’s moves. 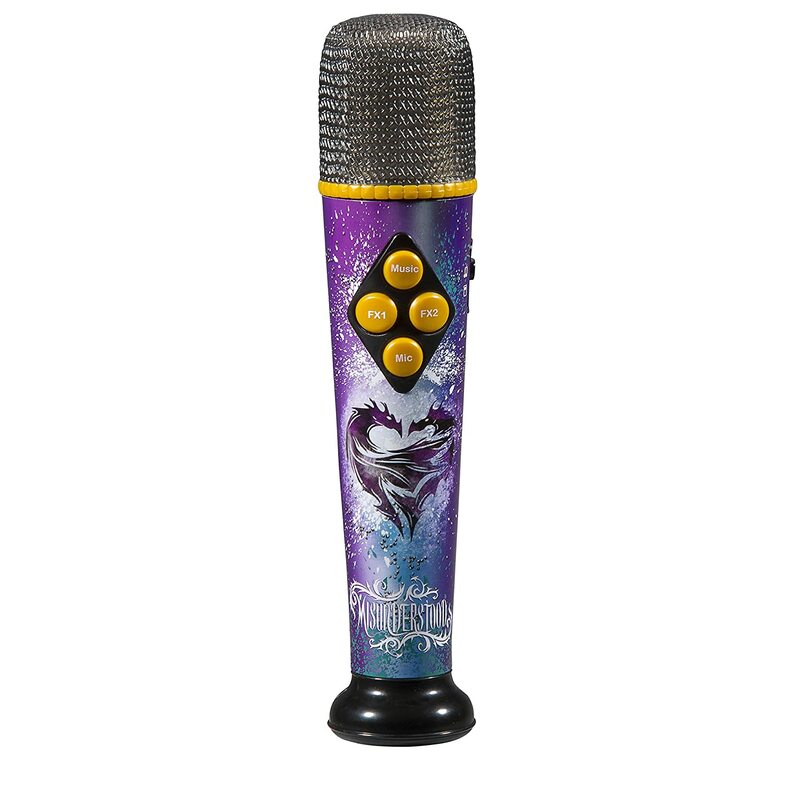 They are going to lose their little VK minds when they discover that this microphone’s got pre-loaded backing tracks to some of their faves, like Ways To Be Wicked. I’m pretty sure Dada and I will be in for some exclusive live performances, especially because I’m hoping Santa brings two of these. Some toys are just too good to share – plus, Mal and Evie each need their own mic. Obvi! I have a funny feeling they are strategizing here to maximize gift-getting potential. Both girls are in school now, and spend a lot of time at home drawing, coloring, and mastering their penmanship (the apples don’t fall far from the tree – I love the art of writing on actual paper and am teaching Lane cursive. Lauren is on her way, too – Lane draws her traceable letters and helped her learn to write her name!). 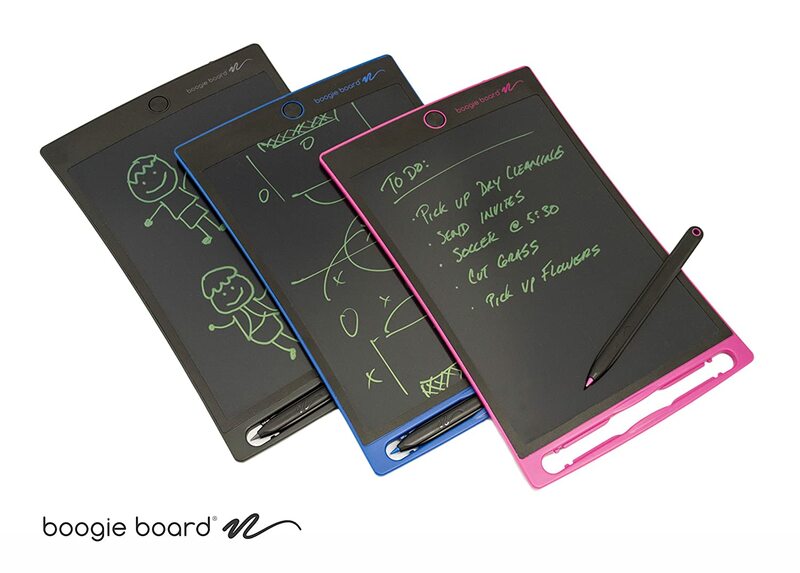 This eWriter is lightweight and has a screen that is engineered to feel just like writing with pen on paper. Their masterpieces will remain on the screen as long as they wish, and can be erased with the touch of a button, so my little writers can create over and over again without paper waste and messy markers. The best part? This baby doesn’t need charging. Perfect boredom buster for car rides! I am all for learning through play and toys that teach, so I was pumped when the girls spotted this puzzle game at the toy store. Both were immediately fascinated and took turns choosing challenges from the puzzle book to solve with the colorful, 3-D puzzle pieces. I thought Lauren would lose interest quickly since she’s so young, but turns out she’s not one to back down from a challenge! Luckily for her, this puzzle has hundreds of possible solutions. Hooray for enhancing their critical thinking and spatial reasoning skills! People who have been following us for awhile know that Lane is a die-hard Elena fan – remember her Avaloran fiesta? Well, the love is still going strong and I just know that she will be delighted by this larger than life Elena doll. In fact, I’m almost positive that if this doll shows up under the tree, she will immediately be given a designated spot in Lane’s room near the rest of her prized Elena paraphernalia – and will more than likely go on her “Lauren may not touch this” list. This one’s just for Lauren, although if Lane will share her Elena doll, I’m sure something might be worked out. Little Lauren caught sight of this adorable role-play center on a YouTube Kids toy review and has been talking about it ever since. If there’s one thing she can’t get enough of, it’s dress-up and pretend play. This all-in-one nursery will provide countless hours of exactly that as she explores the electronic patient laptop, light-and-sound features, and accessories. Mama was hoping the days of large toys like this were behind us (we gave up on any hope of designating toys to a specific area long ago – we’ve lost the battle dollhouses, train sets, pop-up tents, etc. ), but we will find a nice spot in Lauren’s room for her own little doctor’s office… if Santa brings it, that is! Over the summer, we took the girls to HASCON, Hasbro’s first-ever toy convention. This unique event was incredible, and featured amazing displays, activities, and interactive experiences connected with all of Hasbro’s most popular brands. Lane and Lauren got “pony-fied” (think bright nails, colorful hair extensions, and glitter tattoo “cutie marks”) at a pop-up salon in a recreation of My Little Pony’s Equestria, created art with a larger-than-life Play-Doh “Doh Vinci” exhibit, and listened to world-renowned storytellers… but despite all the excitement, Lauren’s favorite part of the event was discovering the classic game Hungry Hungry Hippos! 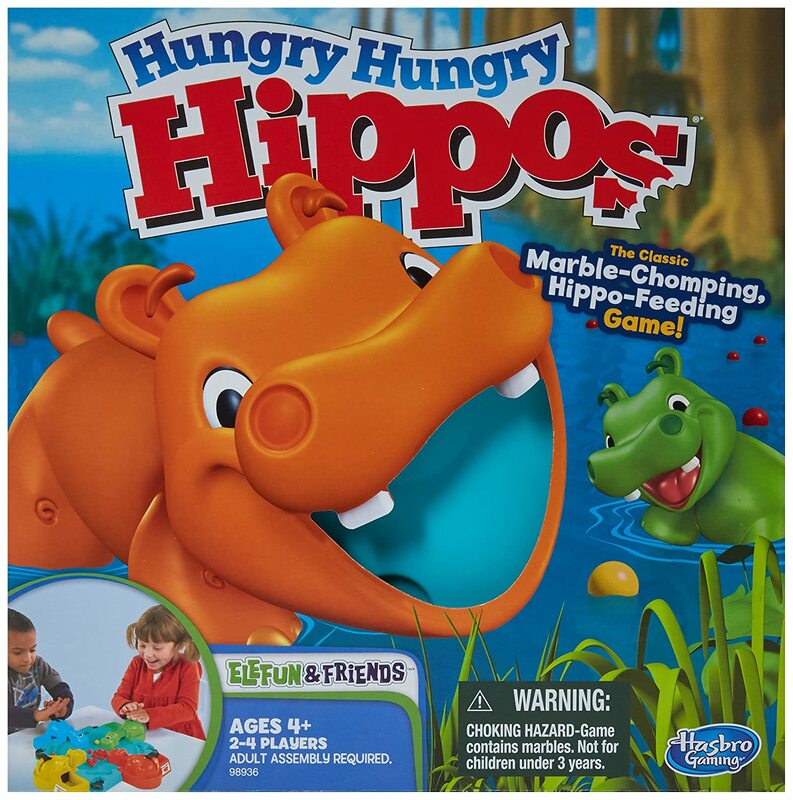 She sat down and started playing this game, and after that, there was nothing that could pull her away! I can’t wait to see her face light up if Santa happens to leave this under the tree. I blame Cookie Swirl C for the fact that the L.O.L Surprise! Fizz Factory set ended up on this list. I imagine Santa knows what exactly this toy is all about, but I’m a bit puzzled. 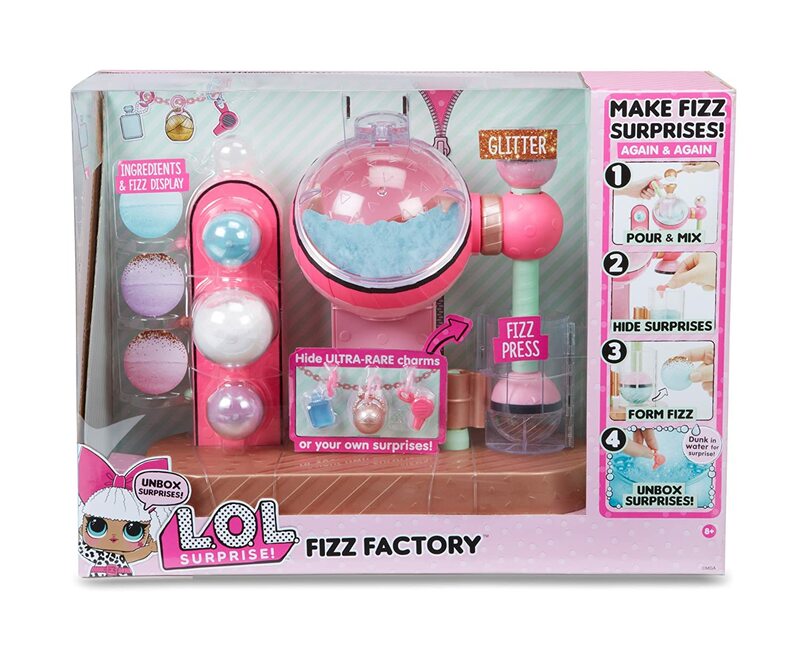 It appears to be some sort of glittery chemistry experiment in which the result is a fizz ball of some sort with a hidden surprise that’s revealed when the ball dissolves in water…? I think? Whatever it is, Lane is obsessed with it and is adamant that it appear on her most wanted list. To be honest, it looks like something that will be used a couple of times and never again, but time will tell. 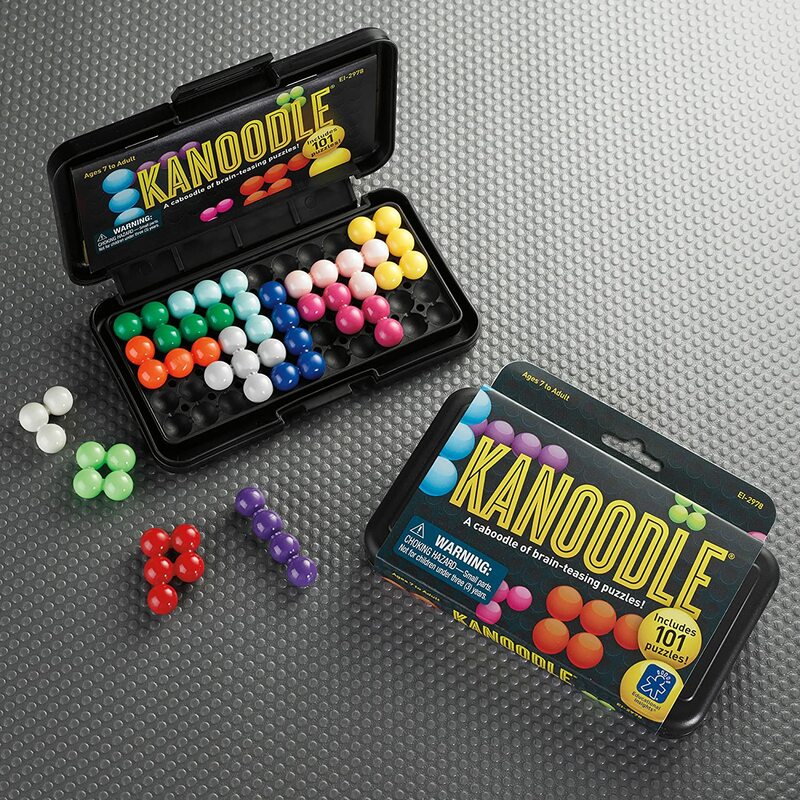 According to the product description, these fizz balls can be made with household ingredients. Sounds messy – stay tuned. Of course, Mrs. Claus would never allow Santa to get away without leaving at least a couple of cute new things for the girls to wear… From what I hear, she has great taste and found these fabulous things to leave under the tree… now if only she could stitch them in Mama size! Girls’ Shaggy Faux Fur Jacket, $24.90 at Forever 21. Lane will look fab rocking this shaggy powder blue jacket. Provides stylish warmth, but not too bulky for the car booster seat. Love! Silver Sparkle Sherpa Jacket, $21.99 at Crazy 8. Lauren is all about sparkle, and I know she will totally rock this adorable, edgy jacket from Crazy 8. It’s available online now for $21.99, but I actually scored this at our local store for $14 last weekend! Clarice Single Strap Velcro Sneakers by Cat and Jack, $14.99 at Target. Lane looooooves purple, so these were an absolute no-brainer. I had no idea a child could wear out sneakers so quickly, but the ones she got in September for school are just about ready to kick the bucket. We’ll see how these metallic kicks hold up to kindergarten recess, but at $14.99, you can’t really lose. Girls’ Skirted Legging by Cat and Jack, $11.99 at Target. If it doesn’t have a tutu, Lauren is not wearing it. 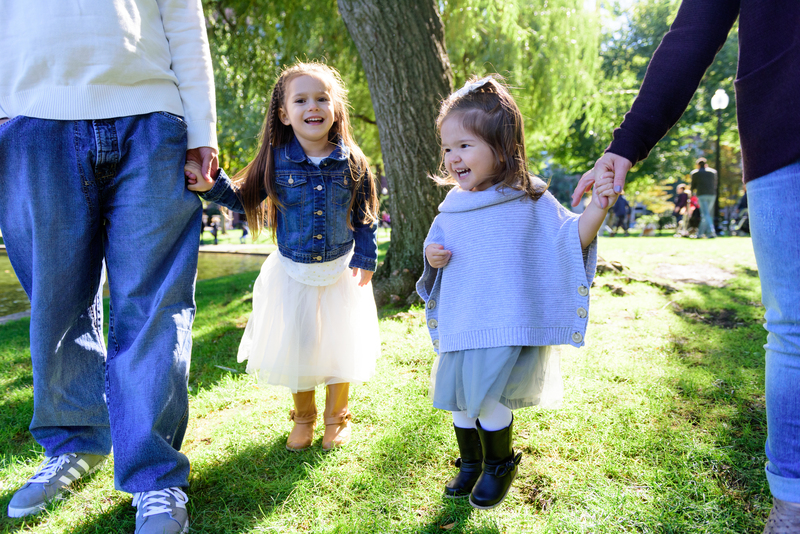 Dressing this little fashionista in the winter is no easy task – she regularly attempts to negotiate wearing her favorite summer sundresses to pre-school, despite the fact that there’s snow on the ground. Thankfully, these supercute leggings align with my little diva’s flair for fashion and love for tulle – but we can pair them with sweaters and boots! I hope the girls’ wish lists inspired those of you still searching for gift ideas for the fabulous little girls on your “nice lists…” now let’s hope Lane and Lauren stay on Santa’s good side for the next two weeks!